Floor-to-ceiling windows open up the space to let in the ocean air. Relax by the next door pool with a refreshing drink from the pool bar. Regency on Beachwalk Waikiki by Outrigger is a comfortable boutique Oahu resort in the heart of Waikiki offering basic amenities and three on-site restaurants. Guests of Regency on Beachwalk Waikiki have access to the outdoor pool and hot tub at the nearby Outrigger Reef. Grab sunscreen, the kid’s pool toys, and a few magazines and head over for a day of underwater fun. Go for a swim or grab a lounge chair and relax poolside while the kids splash around. 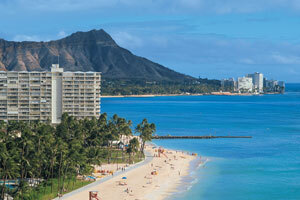 Regency on Beachwalk is located next to Waikiki Beach Walk Mall. For resort wear in original designs, check out Blue Ginger. Pick up one of “Hawaii’s original Aloha shirts” from Kahala Sportswear and a ukulele from The Ukulele Store. Treat yourself to a new swimsuit from Kai Luxe or Sunshine Swimwear. Hungry? Cheeseburger Beachwalk, Ruth’s Chris Steakhouse, and Yard House are just a few of your dining choices. Be sure to stop by Honolulu Cookie Company and pick up some treats to take back to your condo. One- to two-bedroom condos sleep four to six guests, offer city or partial ocean views, and come with full kitchens, living and dining rooms, and large, private furnished lanais that are perfect for watching the sunset. It’s just a short walk to Food Pantry and ABC grocery stores to stock your full kitchen; bring the family along to make sure that nothing important is forgotten. Get in touch with your inner-Betty Crocker and bake up a batch of brownies. Let the big kids assist with cracking eggs, and the little kids assist with mixing. Don’t worry if everyone ends up covered in chocolate; there’s an on-site laundry facility. Enjoy the brownies while you catch a sitcom rerun on the flat screen TV, it has cable. Pack a picnic lunch, have the kids grab their buckets and shovels and take off on the short walk to Waikiki Beach. Catch up on your latest beach read while the little ones see who can build the biggest sandcastle. Surprise the kids with a visit to the Honolulu Zoo. This forty-two-acre zoo is home to several animal species, including some that are endangered. Check out ring-tailed lemurs American flamingos, two-toed sloths, hippopotamuses and various species of frogs and toads. Endangered species include palm cockatoos, Asian elephants, and chimpanzees. Ala Moana Shopping Center has everything you need for some serious retail therapy. High-end brands include Chanel, Burberry, Versace, and Prada. For those looking for a good bargain, there’s Target and Ross. Need an afternoon pick-me-up? Stop by Coffee Bean and Tea Leaf for an Iced Blended. Department stores include Neiman Marcus, Bloomingdales, and Nordstrom. Let the little ones pick out a souvenir at the Disney Store or Toys R Us Express. Replace the phone charger you forgot to pack at the Apple Store and pick out your next beach read at Barnes & Noble.